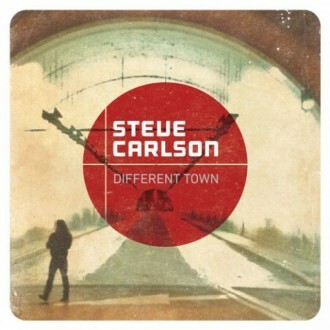 Steve Carlson is preparing to give his fans a unique behind the scenes experience with the soon-to-be-released documentary about recording his album, Different Town. Just as his songs take us on a musical journey, this movie will show the lengths he went to in producing his latest offering. DNM recently had a chance to talk to Steve about this exciting project, as well as his career to date. DNM Magazine: Your latest album, Different Town, was recorded in different cities around the world. Did you find one area more inspirational than any of the others? Steve Carlson: Not really. I spent a lot of my time in Amsterdam mainly because that’s where I based myself for a lot of the European portion of recording. I usually find inspiration everywhere. The minute that stops happening I may need to start looking for it but I consider that aspect of the process a blessing. DNM: You are now in the process of producing a documentary about recording Different Town. At what point in your travels did you decide to make the movie? SC: I decided from the beginning that it was going to need to be journaled in some way. I wasn’t sure it would be worthy of a film until about halfway into it, when I saw how good the footage was. Nowadays it’s so easy to carry around a small video camera with you. For something as in-depth and wild as the project was, it seemed a shame not to. DNM: Your recent album, Sharing The Covers, features cover versions of songs from a lot of different genres, from Elvis Presley to Slade. What inspired your choices? DNM: Your friends, Elisabeth Harnois and Jensen Ackles, are featured on Sharing The Covers. How did you choose the songs that they sing? SC: They chose them. Jensen actually asked me to do ‘Angeles.’ He has loved that song for a long time. Lis and I were with a group one night at her house and she asked me if I knew [Little Black Submarine]. I had been a fan of the song but never learned to play it. We busted out a guitar and I figured out the chords. Someone recorded with an iPhone and later when we listened back we all looked at each other and thought, “Damn, that’s pretty good!” So a few days later, Liz came over and we recorded it properly. DNM: A lot of your songs have one or two standout lines in them (“A harvester of sorrow filled with tiny little drops of lead” and “I’m only as good as I think you think I am” are two of my personal favorites); do the lyrics evolve organically as you write or do specific lines come to you and you build the song around that? DNM: You are also a trained chef. At what point did you decide which career path to follow (if you have!)? SC: When I moved back to LA from Hawaii I found it quite hard to find good work. I also moved back because I wanted to pursue something different. I knew cooking wasn’t going to be my lifelong aspiration so I changed direction before I got too comfortable and it was too late. DNM: Are you working on anything right now that you can share with our readers? SC: Haha, what am I not working on? Obviously Different Town is my main focus right now. I am also putting the final touches on a musical that’s been a huge labor of love. I have two other screenplays that I am writing. I am working on a new album. I’m talking with two different friends about music videos. The other stuff is all top-secret but is in production. I don’t want to spoil the surprise. The Different Town movie has a lot of information not only about the album but my life that I am excited to share with fans and people who don’t know my story or my music as well. Thanks to Steve for taking the time to answer our questions! It certainly sounds like his fans have a lot to look forward to in the coming months. Steve’s music can be purchased on iTunes or Amazon. Official dates for his Different Town tour can be found on his website stevecarlson.com.